The new campus of the Xiangshan School at the China Academy of Art is another signature project by this year's Pritzker Prize winner, Wang Shu. 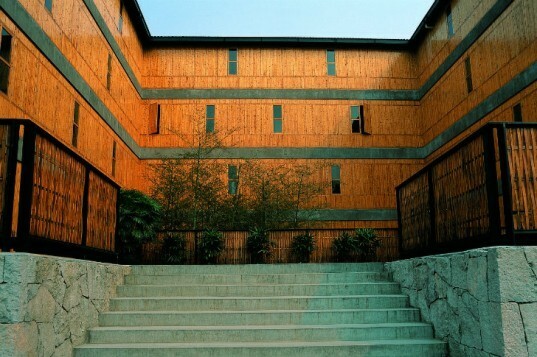 Known as a proponent of traditional design in modern times, Wang Shu designed this new campus to respond to its site while incorporating the use of traditional construction techniques as a means of preservation. Located in Zhuantang Town, Hangzhou City, China, this campus is like a small town that provides living and learning space for students and staff. Gardens, materials reuse, traditional techniques, local labor, and smart design all played an important role in this new yet historic campus. 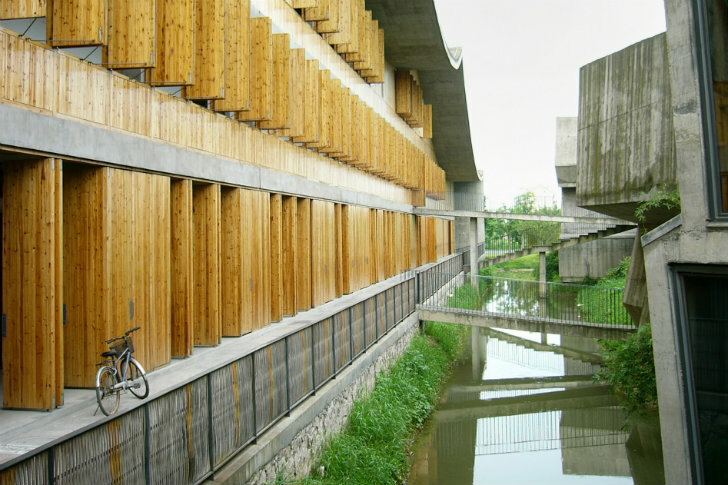 Wang Shu and his wife Lu Wenyu (Amateur Architecture Studio) began designing the Xiangshan School in 2002 and construction was completed in 2004 – a testament to how rapidly projects get built in China. The new campus consists of 67,000 sq m of built area and includes a library, a gallery, a small stadium, a workshop tower, six academic and workshop buildings, two traditional style bridges across the river and two hillside art studios. The Chinese character for “enclose” was the theme of the series and courtyards and gardens are a very important aspect of each building. These enclosed spaces serve many purposes for each building – for events, gatherings, class, relaxation and even for climate control to help encourage ventilation and a micro climate. Each building was carefully designed based on its purpose and location with regard for views, breezes, the sun and its relationship to the rest of the campus. Sunscreens help shield the sun from the interior and skylights pull light in through the interior. The base of the handicraft-school is made with stone using a local method that is traditionally used in the local tea field construction. This was a symbolic gesture representing the rooting of the school in the surroundings. For the roofing, over two millions pieces of tiles of different ages and sizes were salvaged from the traditional houses demolished all over the province of Zhejiang. Wang Shu and his wife Lu Wenyu (Amateur Architecture Studio) began designing the Xiangshan School in 2002 and construction was completed in 2004 - a testament to how rapidly projects get built in China. The new campus consists of 67.000 sq m of built area and includes a library, a gallery, a small stadium, a workshop tower, six academic and workshop buildings, two traditional style bridges cross the river, and two hillside art studio. The Chinese character for "enclose" was the theme of the series and courtyards and gardens are a very important aspect of each building. These enclosed spaces serve many purposes for each building - from events, gatherings, class, relaxation and even for climate control to help encourage ventilation and a micro climate. Each building was carefully designed based on its purpose and location with regards to views, breezes, the sun and its relationship to the rest of the campus. Sunscreens help shield the sun from the interior and skylights pull light in through the interior. The base of the handicraft-school is made with stone using a local method that is traditionally used in the local tea field construction. This was a symbolic gesture representing the rooting of the school in the surrounding. For the roofing, over two millions pieces of tiles of different ages and sizes were salvaged from the traditional houses demolished all over the province of Zhejiang. The most striking part of Xiangshan School is that it looks like it could have been built over a hundred years ago and yet it is modern construction that makes use of steel framing, windows, skylights, and other modern amenities. Wang Shu's dedication to traditional methods and materials is exactly why he was awarded the Pritzker and he is showing the world that there is more to Chinese architecture than glass and steel high rise buildings. In the Jury Citation they describe Wang Shu: "He is also capable of creating buildings on an intimate scale, such as the small exhibition hall or pavilions inserted into the fabric of the historic center of Hangzhou. " "In the Jury Citation they describe Wang Shu: "He is also capable of creating buildings on an intimate scale, such as the small exhibition hall or pavilions inserted into the fabric of the historic center of Hangzhou."